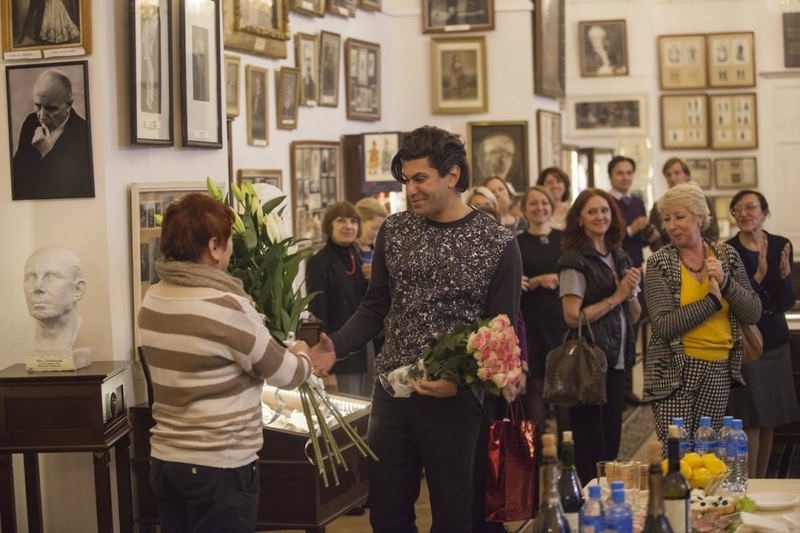 The 28th of October 2015 marked the end of Nikolay Tsiskaridze’s first two years as head of the Vaganova Academy and the staff celebrated the occasion with a small get together. His appointment was controversial at the time, and many high ranking dancers and administrators spoke out against the Bolshoi dancer being given the top job at the Mariinsky school, a school that he hadn’t come through himself. However, after two years the consensus seems to be that he is doing a good job and is popular both inside and outside the revered Academy’s walls. On paper his achievements look good, though of course it is the calibre of the dancers who graduate which counts in the end, but as the Vaganova is not only a ballet school but also an academic institution, paper does play its part. For example, Tsiskaridze re-launched the Vaganova’s publishing house which has published both new Russian works as well as translating books into Russian. He has also raised the profile of The Bulletin of the Vaganova Ballet Academy which from 1991 was published every two years, yet now has a 200 to 300-page edition coming out every two months. The rather austere publication contains original articles and as well as dissertations by degree and doctorate students, and is also freely available to consult online. Recent articles have included The concept of choreography, dramaturgy and motifs in Balanchine’s ‘Symphony in C’; John Cranko: revisiting the creation of a full-evening narrative ballet; various essays on Tchaikovsky’s music; and a piece by Tsiskaridze himself called, We had to find our own accents which discusses Roland Petit’s Carmen. He also restored the chair of Ballet History and Theory at the Academy. Tsiskaridze’s exotic mane, plucked eyebrows and flamboyant nature probably did not help him to be taken seriously when he was appointed head of the Vaganova Academy, yet there was a very practical reason for why he was selected for the job, as he explained in a recent press conference. When Russia entered the Bologna Process, Grigory Ivliev [former head of State Duma Culture Committee and current Deputy minister of Culture of the Russian Federation] asked me to act as representative of the ballet world. I ended up regularly attending the State Duma meetings, although I don’t belong to any party. The Bologna Process aims to ensure comparability in the standards of higher education qualifications among European countries. In order to be able to properly communicate with the ministers and the government officials, I had to familiarise myself with the laws. I read everything I could get my hands on, and my hair stood on end as I did. There are so many things that are completely incompatible with ballet! I did my best to make sure that some changes were made to the proposed laws. To illustrate my point, I had to literally perform fouettés in front of the Duma members. Vaganova students in class – photo by Olga Abramova. Laws, norms and standards are continually updated by the government, to a point where they begin to contradict the ballet and classical music education system. We can no longer teach music or ballet in the same way as we always have, because we will be breaking the laws of human and children’s rights. Unfortunately, due to the fact that my predecessors didn’t react to or resist any of these changes, my staff and I are now being forced to clean up the mess. For example, a ballet class runs for one and a half hours but, according to the new laws, we are required to take a break. We cannot do this. A class has to run interrupted. It’s difficult to explain this to government officials, bureaucrats or the public from a moral point of view. Tsiskaridze got the job but, as with any changeover, noses were put out of joint and there were resignations. Some of the management left of their own free will, but all of the teaching staff stayed put. There haven’t been any conflicts [he knocks on wood], only emotions. When it comes to creative individuals, bursts of emotion can sometimes be confused with conflict. When the parties are no longer speaking to each other – that’s conflict! When I came to the Academy, the staff were very nervous. They thought that I would rent the buildings out and fire everyone. I promised them a number of things, and I can honestly say that I’ve kept my promises. It doesn’t matter what school I belonged to. I’ve given my whole life to ballet and serving this art form is the only thing that matters to me. Coming to this holy place only to leave a bad mark is unthinkable to me. How you choose to see this situation is entirely up to you, I only care about one thing: I don’t want to betray the trust and sully the memory of the great people who taught me. He quickly demonstrated that he was on their side and wished to respect and uphold the Vaganova method and traditions. 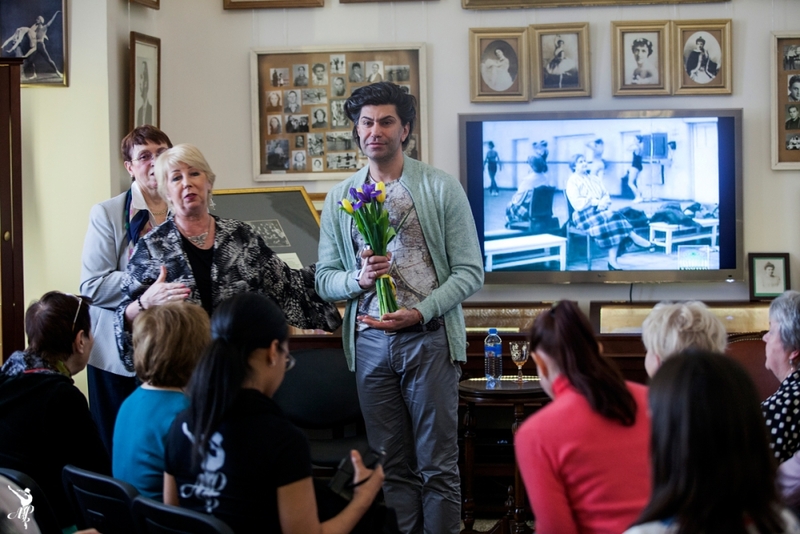 I realised within weeks of joining Vaganova, that not a single meeting ensuring a consistency of the teaching method had been held at the Academy since the death of Konstantin Sergeyev 23 years before. I watched classes and saw the same movement taught differently by different teachers. There are still some ballet teachers around who were taught by Vaganova herself so I brought them in for a meeting. They told me, ‘Kolya, no one’s asked us for advice, and we’re not even invited to the exams.’ They were very grateful when I called a meeting to discuss teaching methods. Tsiskaridze doesn’t have his head in the clouds with theoretical notions. As a dancer with an important international career, he is practical about the requirements of ballet companies and their repertoires. At first, I listened to everyone’s opinions, but now I simply say, ‘This is how we’re going to do it.’ This is because we have Vaganova’s textbook to rely on, and there is also a wonderful film, which was recorded in the 1940s, in which Vaganova and Tarasov spend an hour and a half explaining how each little thing must be done. Also, I’ve performed everything there is to perform on the world’s stages and I know which things will be useful to our students when they graduate and which won’t be. That’s why, when someone tells me that we must teach something in a particular way, I respond by saying that although I understand that’s it’s part of Vaganova’s method, I know that when these dancers enter the Mariinsky theatre, they’ll be told that that no one does it this way anymore. Of course, as well as new ways of dancing, new styles of dance have been developed since Agrippina Vaganova died sixty-odd years ago. Modern dance isn’t currently part of the Vaganova’s compulsory curriculum; our priority is classical ballet. I don’t feel that we are teaching classical dance at a high enough level yet, there is still work to be done. I’ve managed to achieve some things but progress takes time. I love and respect Boris Eifman. I told him that if he was interested in getting involved with the Academy, the doors are open. Tsiskaridze is trying to broaden the school’s horizons in other ways too. The students now have the opportunity to perform entire acts of a ballet – from Sleeping Beauty and Laurencia – and not just divertissements as was the custom. Also, for more than 10 years the students have not performed outside St Petersburg, but last June, 170 of them danced at the Moscow’s Kremlin Palace, and soon they will tour to Japan. The teachers holding the auditions were completely overwhelmed and struggled to cope. They haven’t seen anything like this in years. Sadly, Russian health is poor – life expectancy in Russia is twelve years less than that in Britain, for example – and this is reflected in the children who present themselves to the Academy. The majority of the candidates didn’t meet the physical criteria. What’s even worse is that a lot of the children were turned down because of their weak health. It’s a huge problem. The second stage of the application process – this has been the case since the Imperial times – is a physical examination. Only a healthy child can pursue ballet. So what are the differences between the school that trained him and the school he now governs? I don’t think that there is a difference between the two schools. There is, however, a different dancing style, which is dictated by the respective sizes of the Bolshoi and the Mariinsky theatres. Albert E. Kahn talks about this in his book about Galina Ulanova: Ulanova moved to Moscow at 35, so she was a mature dancer with an impressive repertoire, yet she was forced to adjust all of her roles to the new environment. You have to work very hard to be noticed on the Bolshoi stage. Making a movement with your arm isn’t enough – you have to take three steps and then move your arm. Only then will the audience be able to see you. You have to wear much heavier make-up too, because the space between you and the audience is so enormous. The pas de deux in Act III of Sleeping Beauty is a good example: while dancing this pas de deux at the Bolshoi, I would move two metres in either direction, but on the Mariinsky stage I essentially danced on one spot. Sometimes I don’t understand how a show could have possibly been allowed to run. I lament the lack of a tougher approval process: I am against censorship but I am all for common decency. I don’t think there’s a need to show inappropriate things. I don’t feel that it is necessary for an actor to unzip his fly between proclaiming “To be,” and “or not to be”. The tragedy of the Titanic took place because it was impossible to make a ship going at full speed come to a halt. Momentum carried it forward, and it’s the same here. One can only achieve change gradually. As far as classical ballet education is concerned, the rest of the world struggles to compete with Russia. Our knowledge has been passed on ‘from feet to feet’ for centuries. Now that I’ve been a director for two years, I can tell you for a fact that a great deal depends of whoever is in charge of the school. It’s an enormous responsibility. Nikolay has already proven that he does a better job at Vaganova than his predecessors. There will be people who disagree with this, but his determination to do a good job can’t be denied. I’ve always been a straight-A student. I always try to do my best. I can’t say that I’m a genius who’s done everything perfectly, but I’ve certainly aimed for perfection. There are currently rumours in the corridors of the Bolshoi that as his contract with the Vaganova finishes in 2018, which is also when the Bolshoi’s General Director Vladimir Urin’s contract expires, then maybe Tsiskaridze will take over in Moscow. I will always be a Bolshoi Principal Dancer but one day I will become a former director of the Vaganova Academy. There is no such thing as a former principal dancer but there can be a former artistic director. Managers have an expiration date. and to Elizaveta and Marina Radina for providing links and resources. Thanks for share this very interesting article! Really interesting. He has a thankless job. Diehard Mariinsky supporters are a tough group dedicated to the past. I can’t thank you enough for doing this! Thank you! I enjoyed this article very much. Thanks. Oops they made a mistake, he did not negotiate with Balanchine trust initially for Raymonda variations. Another foundation did and funded it and brought it to the Academy for the first time in its history. Give credit where credit is due. It is certainly wonderful to respect heritage and the Vaganova ‘system’ is appreciated all over the world. It certainly is also important to adjust to the present with heritage in mind. The important question is to nurture choreographic talent. It would be of value to know how choreography is nurtured (if at all) and viewed in the Vaganova Academy training policies and if so at what stage of training?